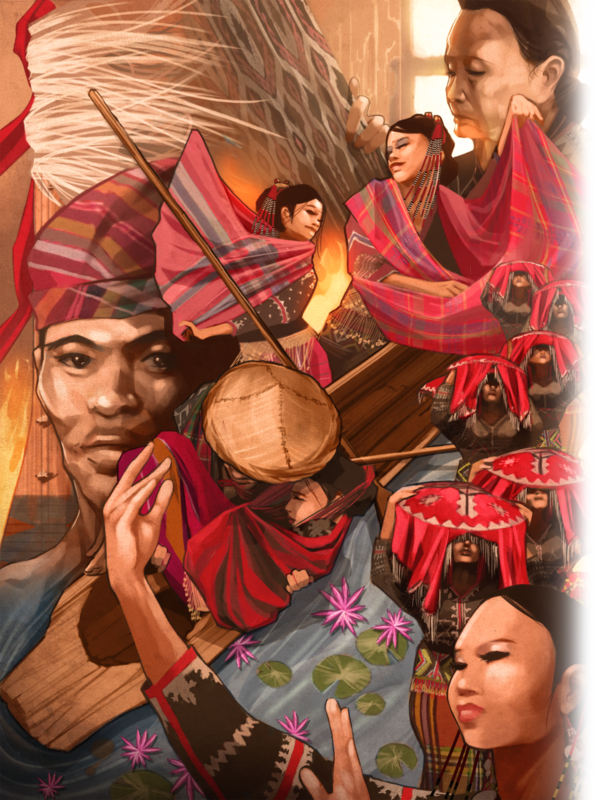 In the mountain of Cotabato lives a colorful ethnic group known as Tboli. This group has many names including Tagabili and T'Boli. The culture center falls more or less in the central part of a triangle whose points are the towns of Surallah, Polomolok and Kiamba. Within this triangle are three major lakes: Lake Sebu, Lake Lahit and Lake Selutan. The T'Bolis are people of medium build. They are light in complexion. Some of them are square-jawed. Their hair may be curly or straight. T'Boli women dress in a long sleeved, tight-fitting, waist length, collarless blouse which is in plain black, dark or navy blue. Their tubular skirt is ankle length. For special occasions, the T'Boli woman is dressed in a pin-striped linen skirt. T'Boli men, no longer wear traditional attire. Today, they normally go about in ordinary pants and skirts, with the typical T'Boli sword which they always carry at their side. Madal is a T’boli word for dance. Madal Blelah portrays a mythical bird, which according to tradition, consolidates in itself the feather coloration of all known birds. In farming or traveling, the S’loong Knebang, wide-brimmed hat, veiled-over with an appliquéd red cloth, is worn to protect against the glare of the sun. A polygamous male picks his next wife amongst sisters vying for his attention. Translated as a traditional dance this is dance drama centering on a bird with a broken leg coached by the rest of the flock in an effort to try her wings and fly again, in the end the flock of Blelah birds fly again. The eldest daughter is assisted by her sisters to pick from her suitors or a preparation for a wedding. In T’boli means “never ending joy” and also named as their yearly festival held every November to celebrate their rich culture and traditions.